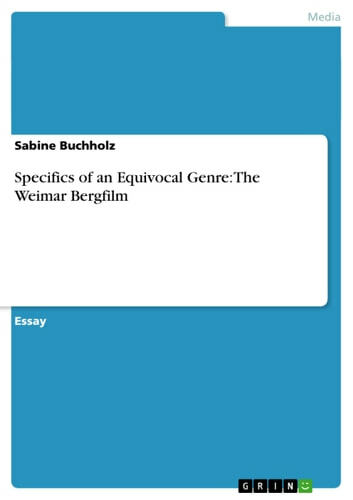 Essay from the year 2004 in the subject Communications - Media History, grade: 1,0, University of Southampton (University of Southampton, School of Humanities: Film Studies), course: Image, Sound and Narrative in Late Weimar Cinema, 0 entries in the bibliography, language: English, abstract: Outstanding alpine landscapes, tremendous vastness, overwhelming forces of nature - these are the features of a film genre Weimar cinema has become especially famous for, and, indeed, even today is often associated with: the German Bergfilm (mountain film). Though discussed in various studies and many essays, the mountain film still is a genre hard to define appropriately, as its particularities include a variety of ambiguities, not only concerning the question whether or not it is - as often claimed - the prototype of an anti-modernist genre supporting the National Socialist attitudes, but also with regard to the query if the mountain narratives are to be considered as the polar counterpart of the likewise popular Weimar city film. 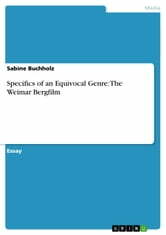 Due to the numerous uncertainties, this essay attempts to analyze to which extent the Bergfilm contains anti-modernist elements as well as parts opposing the city film focussing especially two of the works of the most significant Bergfilm director of the 1920s, Arnold Fanck, namely 'Der heilige Berg' ('The Holy Mountain', 1926) and 'Die weiße Hölle vom Pitz Palü' ('The White Hell of Pitz Palu', 1929). A 'new' and 'historical' theatre in Bertolt Brecht's 'Life of Galileo'? The Holocaust - A Literary Inspiration?